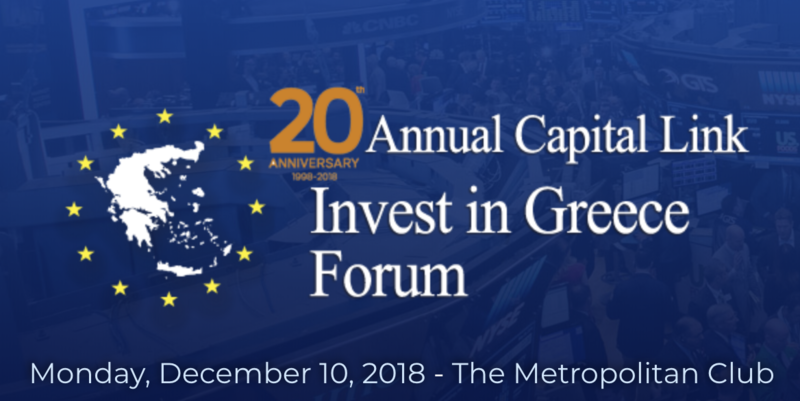 On Monday, December 10, 2018, The Metropolitan Club in New York City will host the 20th Annual Capital Link Invest in Greece Forum. This is an International Summit about Greece in New York organized in cooperation with the New York Stock Exchange and major global investment banks. The Forum will feature government and business leaders from Greece, Europe and the United States, and top executives from the investment, financial and business communities. The conference will feature the developments and reforms in the Greek economy and the Greek government program for the economy and investments. Also, the latest trends in the capital markets and specific sectors with topics such as Government and Corporate Bonds, energy, infrastructure development, real estate, tourism, banking, non-performing loans management, and global shipping. Plato will be participating in the Tourism & Hospitality Panel Discussion along side of Mr. Constantinos Lambadarios – Managing Partner – Lambadarios Law Firm, Mr. George Tziallas – Secretary General for Tourism Policy & Development – Ministry of Tourism, Mr. Stelios Koutsivitis – VP & CEP Astir Palace Vouliagmenis, Mr. Stavros Mitsis – Mitsis Group, and Mr. Constantinos Dedes – Legal Advisor – Mirum Hellas. Thank you to Plato, as well as all of the other participants in this exceptional exchange of information. Proud to be a part of Team Shaner! Congratulations…another exciting moment for team Shaner!